The World Bank has trimmed its projection for Thailand’s economic growth this year to 3.8% from 3.9% estimated earlier, due to a global slowdown and elevated trade tensions between the United States and China. PRIME MINISTER Prayut Chan-o-cha appeared to admit for the first time yesterday that the expected election date would be altered after weeks of uncertainty. Construction of electric train projects in Bangkok has been halted for seven days as the government scrambles to combat the toxic haze shrouding the capital. A “shipwrecked” trawler that once belonged to a Thai owner was found fishing in Somalian waters, according to Interpol. BANGKOK’S AIR quality has not reached a critical level yet, authorities said, though the daily average of PM2.5 levels in the city has remained above 50 micrograms per cubic metre of air during the last seven days. Thailand’s immigration chief vowed Wednesday not to force refugees to return home “involuntarily”, after a Saudi woman’s desperate plea for resettlement drew global attention to a country that does not recognise asylum seekers. The Election Commission (EC) is highly likely to select March 10 as the election date as it has agreed that the 150-day deadline for the general election to be completed as set by the charter should include the poll results endorsement. AS HIGH-quality facemasks to protect against dangerous smog are in short supply, research found that common facemasks with several levels of additional tissue papers or a folded handkerchief inside may suffice to protect Bangkok residents from small airborne dust particles. The two Khon Kaen Models–one an alleged red-shirt terrorist plot and the other a transit infrastructure project–effectively model the process by which the junta secures obedience: the NCPO’s power expands through suppressing political activity on the one hand and endorsing apolitical development projects on the other. Prime Minister Prayut Chan-o-cha reaffirmed today that the much-awaited election will definitely be held by May 9 but gave no indication when exactly it will take place. The ongoing air pollution problem caused mainly by excessive amount of PM2.5 dust particles in and around Bangkok can cause economic damage estimated up to 6.6 billion baht if it is allowed to persist for about a month, according to the Kasikorn Research Centre on Wednesday. The Tourism Authority of Thailand (TAT) said on Wednesday the country welcome foreign tourists during the celebration of Chinese New Year and Thai New Year Songkran water-splashing festival after the Thai government has approved the extension of the visa-on-arrival fee waiver for citizens of 20 countries and regions until April 30. Mahidol maintained its status as the best university in the country in this year’s World University Rankings by Times Higher Education, which added more Thai tertiary institutions to its list. To help curb fine-particle dust pollution in Bangkok, traffic police have increased the number of checkpoints where they will check vehicles spewing black exhaust smoke. The Bangkok Military Court on Wednesday dismissed the case against 19 leading red-shirt members charged defying the ban on political gatherings in organising the launch of a centre to monitor the 2016 charter referendum. Thailand’s deputy junta leader said Wednesday it was “good enough” that no Thais were killed in an apparent terror attack on a Thai-owned hotel complex in Kenya that left at least 14 people dead. Artificial intelligence will be operating the traffic lights at all 505 intersection in Bangkok ‘soona’, rather than police officers manually working the switches, according to a senior policeman. Baker McKenzie recently advised Thailand’s State Enterprise Policy Office, the Ministry of Finance, and fund managers Krungthai Asset Management and MFC Asset Management on the establishment and IPO of THB45.7 billion (US$ 1.4 billion) of investment units in Thailand Future Fund (TFFIF). Three residents of Narathiwat’s Sungai Padi district are accusing local police of extorting 400,000 baht from them in exchange for freeing them from detention after what they described as a “fake” drug crackdown. A kindergarten in Chatuchak district has suspended classes because of air pollution that has landed Bangkok on the top 10 list of worst-polluted cities. The announcement that Thailand’s best-known police officer had arrived sent gasps of shock across a news conference at Royal Thai Police headquarters. Ending monopolies, increasing farmersâ income some of the strategies put forward ahead of upcoming elections. Restaurant chains and delivery companies have reaped a windfall from the ongoing haze, saying their food delivery services have skyrocketed as consumers in Bangkok opt to stay indoors, fearing poor air quality. THE DEPARTMENT of Health has set new targets for 2019, following evidence that an increasing number of Thai children are reported to be overweight and too short for their age. Businesses needing to make payments to the Customs Department can now do so through online banking. Thailand’s wealth inequality is the highest in the world: What will this mean for the upcoming elections? Thailand now has the largest wealth gap in the world, according to a recent report by Credit Suisse. A tsunami-warning buoy worth Bt12 million will be installed off the coast of Phuket, to replace the one that had been broken two years ago, disaster officials said on Wednesday. Thailand’s Digital advertising market spend is poised to reach 124 billion baht in 2019. That’s a growth of nearly 5%. But newspapers, magazines, Cable TV and radio are on the nose as marketers stick with terrestrial TV and ramp up their digital portfolios. The Stock Exchange of Thailand (SET) plans to apply for a digital asset operating licence from the Finance Ministry, aiming to open a new exchange and become an authorised digital asset exchange this year. Thailand franchise consultancy Gnosis Co expects a healthy market for franchises in the country. Infofed Co, a Bangkok-based e-sports startup, has ambitions to build Thailand into an e-sports hub in Southeast Asia to capitalise on the US$4 billion global market. 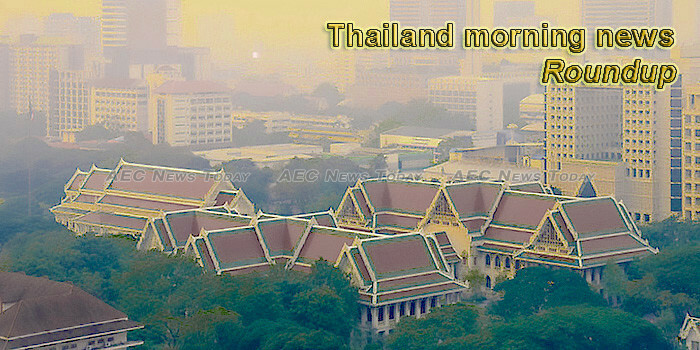 Urgent meetings are being held in Bangkok today to address the acute smog problems in the capital. After concluding the Cabinet retreat in Chiang Mai, the Prime Minister chaired the launch of a One Tambon One Quality School project in Lampang province. The Industry Ministry has ordered all agencies under its umbrella to set stricter measures governing factories producing high levels of fine dust in Bangkok, and it plans to take legal action against any that exceed established pollution limits. The Public Health Minister, Clin. Prof. Piyasakol Sakolsatayadorn, said Thailand’s ban on artificial trans fats came into effect last week, making the country the first in the ASEAN to ban the production, imports, and sales of partially hydrogenated oils as well as any food items that contain them. The Electronic Transactions Development Agency (ETDA) aims to attract 1 million teenagers to join the e-commerce workforce and 200,000 micro-SMEs to go online this year to boost the online economy. THAILAND is well placed to establish itself as the main centre for corporate capital raising in the Asean region, thanks to the countryâs economic potential, market liquidity and supportive financial regulations, said the founder of an advisory group with connections across the region. The Rubber Authority of Thailand has launched a 20-year rubber strategy with a focus on research on rubber processing and promotion of domestic consumption. Shares in Thai telecom companies are off to a lackluster start this year as the heavy investments needed to roll out faster 5G networks are expected to depress the sector’s earnings. The Department of Internal Trade (DIT) has begun coordinating with face mask producers and importers to increase the supply of N95 type masks for those contending with the smog problem in Bangkok and its vicinity. With the Thai property market expected to continue slowing down, SET-listed developer Raimon Land Plc (RML) wants to diversify more to hotels and in-vitro fertilisation (IVF) ventures, with a combined investment of 5.3 billion baht. MasterCard Global Destination Cities Index has published a survey on the dining and shopping (GDCI: Indulgences) spending patterns of tourists in various cities around the world. The Department of Medical Sciences has launched a workshop to tackle a global threat of infectious diseases. JAPAN’S Shinwa Group is using Thailand as the springboard for the sale of its innovative construction technology to property developers throughout the Asean region. Pattaya police arrested three Filipino women for collecting donations from tourists for an ‘imaginary’ children’s foundation. The man accused of murdering his wife and four in-laws in Uttaradit is also alleged to have swindled almost 30 million baht from a priest, the rector of a Catholic college in Chon Buri province. Provinces neighboring Bangkok have begun to report that they are also contending with the smog problem affecting Bangkok. THE NATIONAL Teachers Day has again highlighted the importance of the 400,000 people tasked with educating children to ensure a good future, and has also brought to notice problems in the education system and the dire need for adjustments. The University of the Thai Chamber of Commerce (UTCC) says that e-Commerce business will be among rising stars this year. Three men and five women were arrested for allegedly running football gambling website i99bet.net, with a six-month turnover of 200 million baht, from a server located in Cambodia, police said. An anti-narcotics team led by Border Patrol Police have arrested a maid from Chalong who was hiding 2,600 methamphetamine (ya bah) pills and three kilograms of packed cannabis in a client’s home in Rawai. Netflix has started production on survival drama The Stranded as its first Thai shoot.